Can political ecology offer a real progressive alternative in the French political landscape, currently marred by scandals, crises and polarisation? In this interview with Lucile Schmid and Michaël Fœssel, Yannick Jadot sets out the vision behind his campaign, as the candidate nominated by Europe Ecology – The Greens in the upcoming French presidential election, and explains why he is determined to speak up for social rights, Europe and the environment. What is the significance of having an environmentalist candidate in the French presidential election? In the coming world, political environmentalism holds a special responsibility. The system that is being put into place with Trump, Putin, Erdogan, and Xi Jinping raises the question of development models. I do not believe that the populism expressed in the American elections is a response of the poor to class inequalities: Trump himself is the incarnation of the ostentatious nouveaux riches. Instead, this populism comes from the abandonment of a large part of the population, and governments’ unwillingness to fight for social justice, against discrimination, and against environmental degradation. This populism, which is found nearly everywhere, is all the more dangerous in that it rejects plurality and diversity. It amounts therefore to a rejection of today’s society. In this context, environmentalists should be the bearers of a collective and shared project to recast Europe as a vehicle for public regulation of globalisation, grounded in human, social, and environmental rights – respecting the limits of the planet and the well-being of all. These rights must come before commercial and financial interests. In each country, this project will rebuild the national community by making citizens agents of change and returning to them the means to control their lives. The struggle against nuclear weapons, against fossil fuel, against waste, and for renewable energy is not simply a question of technology, but rather of the democratic construction of society and decentralisation. Society must take back control of major issues. To rebuild democracy, we must relocate a part of the economy (thus re-establishing solidarity), maintain public services, and promote culture. In a world of such increasing uncertainty, retreating into isolationism and minority identities responds to people’s need to belong and feel protected. We must engage in political struggle against those who romanticise the ‘typical’ communities of the 1950s: white Catholic families, where women did as they were told and should be ‘seen and not heard’, where immigrants had to be highly submissive, and where homosexuals stayed in the closet. According to this model, notably promoted by the National Front, people join together because of their perceived similarities and then hate everyone else. Clearly for us, an open society is all-encompassing. We need to arrive at this open society from the Left and firmly establish it in order to counter the National Front’s discourse. We must offer an alternative: local open communities, where someone who just arrived from Syria is equal to a person who believes they come from a purely French family. Indeed, they must be guaranteed the same rights, be treated with the same dignity, and be given the same agency, or power to act. It is difficult to maintain this discourse in France because of a ‘Jacobin’ tradition according to which the centralised State speaks for society and represents the general interest. For this reason an environmentalist candidate is essential to contemporary political life, to regain territory, rebuild the national community, and bring a new perspective on Europe. The European issue today has been completely side-lined, and Hollande was worse than Sarkozy in that regard. Europe should have a vision of global justice, peace, diplomacy, defence, migration policy, and a model for development. In the words of Bruno Latour, ‘Europe is alone, but only Europe can save us’. How would you define your federalist ideal in the current context? What would ensure, from an institutional point of view, that a supranational regulation of environmental and economic issues would be better than what we are seeing today? In national politics, hasn’t federalism become the Trojan horse of neoliberalism over the past twenty years? We have never had an environmental policy in our country. French environmental policies are merely a translation of European environmental policies, which are imperfect. At the international level in the 1990s, the end of the Cold War was interpreted as the victory of democracy, when in fact it was above all a victory of liberalism. Yet these years were also the belle époque of the United Nations, with the prospect of a well-functioning multilateralism. But the liberalism that was imposed everywhere stifled transnational politics by concentrating wealth in the hands of firms that became the most powerful players in international regulation. This liberalism built its legitimacy on its claim to be a driver of development and democratisation. Instead, it is now the driver for ‘illiberal’ democracies and autocratic regimes. Europe is a place – however imperfect and incomplete – where a democratic project is being built, and is not responsible for this situation. Is France doing well and Europe badly? Would Greece be better off without Europe? Today, at the cost of incredible sacrifices, Greece wants the euro. It is foolish to claim that a liberal Europe is in opposition to nation-states that would be the heart of democracy. The European Union, like our countries, develops policies that are the result of political majorities. It’s up to us to change these majorities to change these policies! Regarding the question of treaties, Germany does not respect them. It has accepted a million refugees without respecting the Dublin Convention, and its trade surplus has exceeded 6% of GDP for six years, which goes against the Stability and Growth Pact. If Greece has been humiliated, it is due to European political power relations. Has our socialist president fought? No, François Hollande played ‘good cop’ to Wolfgang Schäuble, the German Minister of Finance: he convinced the Greeks to accept an unrealistic austerity project to be renegotiated later. Was this discourse that Hollande has adopted since 2012 imposed by Europe? Hollande, together with Mariano Rajoy in Spain and Mario Monti in Italy could have changed the direction of Europe in 2012 by imposing a reduction in budgetary discipline and reviving investment. But he did not do so. I propose investing 600 billion per year, financed by the European Investment Bank and national investment banks – guaranteed or repurchased by the European Central Bank. Today the European Central Bank is buying 60 billion euros of public debt per month in secondary markets, which feeds the banks but does not revive the economy. Without amending current treaties, this stimulus plan can be easily achieved and this would be the key to renegotiating the European balance. The crisis of solidarity between East and West, including the issue of posted workers, between North and South, and within our societies, obliges us to smooth out proceedings – particularly in the areas of energy transition, digital technology, transport, and health, among other issues. Then we can negotiate a defence policy with Germany and a policy on posted workers with Eastern Europe. If we had done this in 2012, we would not have European austerity, but would have created jobs. 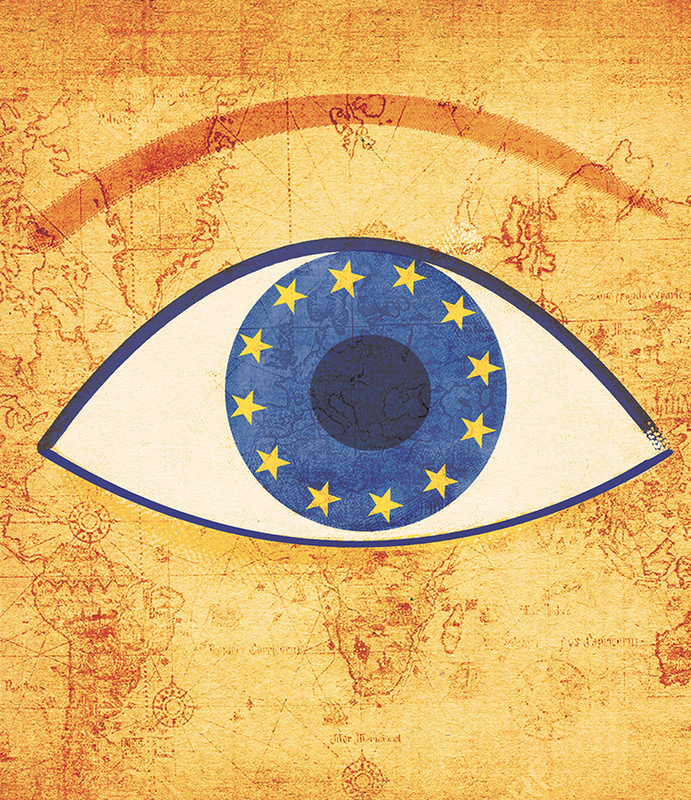 The Europe of nation states is a withdrawal into national self-interest. We need to develop a federal Europe and cooperate on issues such as refugees, tax evasion, terrorism, and the climate. We also propose regional citizen conventions across Europe to discuss the features of a shared European sovereignty. Sovereignty is achieved when democratic reflection makes it possible to agree on public decisions that are effective and serve the general interest. Let’s build a European constituency! Today, the disaster paradigm has been imposed on environmentalists. How can you manage both a democratic position of emancipation and an authoritarian position linked to ecological requirements? I challenge the idea that we must always focus on disasters. An important part of the work of environmentalists is alerting citizens to the ecological crisis. The reality is that if we do not fight against climate disruption, against species extinction, against resource depletion, and against the outburst of chronic diseases linked to pollution, our future will be bleak. The catastrophic scenario is here – it has been constructed, demonstrated, and scientifically proven. But I will not be the apocalyptic candidate: focusing only on disaster provokes anxiety rather than leading to the necessary transformations. In the environmentalist tradition, these transformations are part of a democratic process that is built on autonomy and responsibility. We need massive public support for implementation of an environmental plan, and that means changing our institutions – setting up a proportionally elected parliamentary system that represents the majority of society. I am in favour of territorial ecological transition contracts that will get us out of outdated forms of industry that only survive on state subsidies (such as the diesel sector), as well as supporting vocational retraining. It is therefore a question of working with citizens, businesses, and employees to build the world of tomorrow. Isn’t it counterproductive to put the issue of nuclear energy, which is still being debated, together with climate change, where there is consensus? The experience of the United States shows that not all companies have switched to the climate economy. There is even a counterrevolution, in which major energy companies, working with states, are claiming a form of energy sovereignty. If France has sabotaged its renewable energy policy, it is because it wants to work with nuclear energy. It is certainly easier to talk about climate disruption, but if a power plant were to explode, it would be an absolute disaster. And I will be the first to say that we must recruit and train nuclear engineers due to the current age pyramid. Nuclear has gone bankrupt: Emmanuel Macron and others supported the EPR reactor project at Hinkley Point. This will destroy the EDF financially, threaten our public energy services, and force the British to pay two to three times what renewable would cost for their energy services. Environmental voting can often be apolitical. In a context where several candidates claim to be environmentalists, where do you stand on the political spectrum? The lines on the political chessboard were drawn in the 19th century and they had to do with the issue of sharing added value. Political environmentalism is not part of that age – it supports individual and collective emancipation, solidarity, decentralisation, and Europe as an open society. These are liberal political values, but it doesn’t make sense for us to position ourselves to the left or the right of the Socialist Party. We should not ask ourselves if environmentalists are on the left, but rather if it is possible to be on the left without being an environmentalist. What are your feelings about the problems of growth? You could explain to people that the end of growth is indeed compatible with social prosperity, against the backdrop of candidates who believe that more work and resources are needed. Such a statement would probably satisfy people’s need for protection. Indeed, there is political space for this type of discourse. Current reactionary political thought argues forcefully that there are no issues with equality and social justice, but rather problems of identity, diversity, and open society. Our country is in such a state that some think welcoming a Syrian refugee would prevent them from caring for a homeless person (even if they don’t care whether people still sleep on the street). This xenophobic vision is extraordinarily powerful. I would like to develop a positive vision of protection and reconciliation. If we can face the future by dealing with ecological issues and social protection, then we will become reconciled with each other and with ourselves. A team of researchers led by Robert Waldinger followed a cohort made up of a group of Harvard students and a group of residents from Boston’s roughest neighbourhood for seventy-five years. Ultimately, those with the strongest social ties – family, friends, and community – stayed the healthiest and lived the longest. We need a humanist project to build up the collective. The discourse on growth has been heard and understood, but the term ‘crisis’ implies that the situation can be reversed. The reality is that our societies will never be as they once were. We need to convince people that tomorrow can be better than today, from an economic viewpoint as well. An environmental programme is neutral in terms of growth. It could certainly involve growth at an early stage due to a policy of investment, but not in the long-term, because a reduction in consumption through reuse, recycling, repair, and compost reduces pressure on resources – and in turn reduces the GDP. However, criteria for measuring growth alternatives to the GDP are not yet part of the public debate. A difficult process of education still lies ahead. You support a basic income model. Isn’t it a challenge to break with the dominant views on work? Are we now in post-employment societies? I don’t believe in ‘post-employment’ societies. Both digital technology and robotics will continually transform the workplace and eliminate jobs, while the processes of economic relocation will create jobs in France. Indeed the issue of labour costs at the international level will become increasingly unimportant in comparison with the quality of innovation and public service infrastructure. I believe there will always be wage labour. The big debate, which is surely even more challenging than the debate on growth, is about the concept of work itself. For many people, dignity and social status depend on work. When six million people want to work, or want to work more, they believe that their dignity is linked with their work, to the quality of their work, and to the possibility of having status in society. We need to start a broad debate about the meaning of work and suffering in the workplace. The debate on universal income should not be based on figures. Doing so reduces the discussion to minimum subsistence allowances, and amounts to extending the individual Income of Active Solidarity (RSA) to everyone. The problem is that you cannot live on 524 euros per month. The Finnish experience with a basic income around this level shows us that this is a neoliberal approach. It consists of breaking down the welfare state, paying out a cheque, and refusing any other form of social protection. In our political system, at the European or French level, there is a high risk that this form of basic income will be adopted. We need to start building a consensus to provide recommendations, and we need to experiment. This is an abridged version of an interview that was first published in French on Revue Esprit.